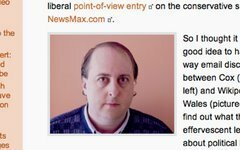 Let's pick another example of Robert Cox's commitment to the principle that bloggers "act responsibly and with personal integrity." "I DO AND IF YOU ARE PLANNING TO WORK AT NBC OR MSNBC YOU WOULD DO WELL TO KEEP THAT IN MIND. DON'T KID YOURSELF THAT MESSING WITH ME IS A COST-FREE EXERCISE FOR YOU."